As past Laureates welcome our President into the fold, we take a look at the concept of peace in the wider world. A week ago, President Barack Obama won the Nobel Peace Prize. Many were shocked. We’ve spent the week struggling to make sense of the decision. There is one group of people who maintained their equilibrium and instantly reached out to welcome Barack Obama into their midst: the most recent Nobel Peace Prize Laureates. If we consider their comments in light of the wider world, we might better understand the choice. But how to visit the wider world? We need to get out there to see what those ominously evoked global values are. We can throw on a backpack and witness conditions firsthand, or… here is an alternative. David Elliot Cohen has created What Matters, a book of images and ideas in which the world’s preeminent photojournalists and thinkers depict the “crucial yet curable” issues of our time. He challenges every one of us to do something, however small, to make this world a better place. 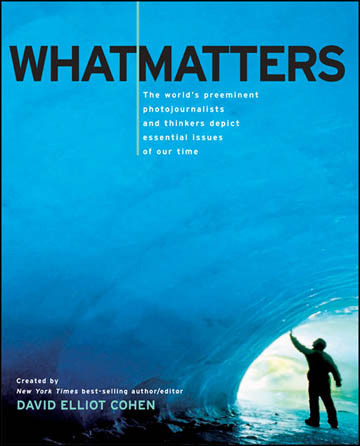 What Matters provides a framework in which to contemplate the Nobel Committee’s reasons for awarding the prize to Barack Obama and the statements of the past Laureates. Obama’s diplomacy, according to the Nobel Committee, is founded on the concept that those who lead the world must do so on the basis of values and attitudes that are shared by the majority of the world’s population, which makes Paul Gigot’s melodramatic hand wringing a little out-dated. One place increasingly devoid of hope is Darfur, as we can see from the eyes of a child on the streets of Adre with his finger on the trigger (What Matters, The Scorched Earth of Darfur – Marcus Bleasdale, photo). Genocide, which President Obama called “a stain on our souls,” must be stopped in Sudan. For this to happen it must move up on the agenda of world leaders. Obama pinpointed Darfur in his call for a new era of engagement among nations. Lawrence Woocher of the U.S. Institute for Peace Center for Conflict Analysis and Prevention said this was notable and indicates a real policy priority. Save Darfur Coalition Board member and co-founder of My Sister’s Keeper, Rev. Gloria White-Hammond said the Nobel Prize should reinforce Obama’s leadership role in Sudan and Darfur with the international community. January 22, 2009, the day after the inauguration, President Obama issued three executive orders. He ordered the closure of the prison at Guantanamo Bay (currently in progress, though the deadline will likely be delayed), and a review of our detention and interrogation policy. He revoked Executive Order 13340 of July 20, 2007 (George W. Bush’s belated attempt to reinterpret those quaint Geneva Conventions). Obama has clearly prohibited the use of torture. This was a first step in healing our image with the rest of humanity. Here at home we only grasped a fraction of what the photos from Abu Ghraib did to our reputation around the world. They struck fear of Americans into the hearts of many and is one of the high costs of the war on terror outlined in What Matters. Maathai knows the difference one person can make and the importance of calling others to action. She planted nine trees in her backyard in Kenya and this grew into the Green Belt Movement – which has planted millions of trees to help restore Africa’s forests. On the 100th day of his administration, Obama signed the Edward M. Kennedy Serve America Act, increasing the size of Americorps and “connecting deeds to needs.” This summer our president launched United We Serve. He has engaged Americans in imaginative volunteerism. When ElBaradei accepted his Nobel, he asked people to imagine a world without nuclear weapons. In awarding the prize to Obama, special importance was attached to his vision of and work for a world without nuclear weapons. The photos in Fallout- The Enduring Tragedy of Chernobyl leave nothing to the imagination. Nineteen years after the evacuation, an empty kindergarten room reminds us of the absolute necessity of nuclear arms reduction and increased safety measures. Other images in What Matters link to the frightening possibility of terrorists using nuclear weapons. Twenty-seven dollars out of his own pocket became the Grameen Bank, which turns Yunus’s vision of eliminating poverty into many realities every day. What Matters is a comprehensive pictorial of the plight of the world’s poor, and the essays offer a sometimes scathing chronicle of our efforts to help. A sharp awareness of the issues—from AIDS to water supply problems to our own consumer culture—is essential in our leaders. President Obama’s advocacy of the poor is reflected in The American Recovery and Reinvestment Act. He is also one of the strongest advocates for the Millennium Development Goals (MDGs). “For a long time—the first fifteen years that we knew about global warming and did nothing—there were no pictures. That was one of the reasons for inaction,” states Bill McKibben in his essay in What Matters, Meltdown – A Global Warming Travelogue. The photographs throughout the book depicting environmental conditions— glaciers disappearing, China’s extreme pollution, scenes from the Niger River Delta—are meant to cause outrage in us, for that is what leads to action. In our country, the 2008 election ended an era of denial. 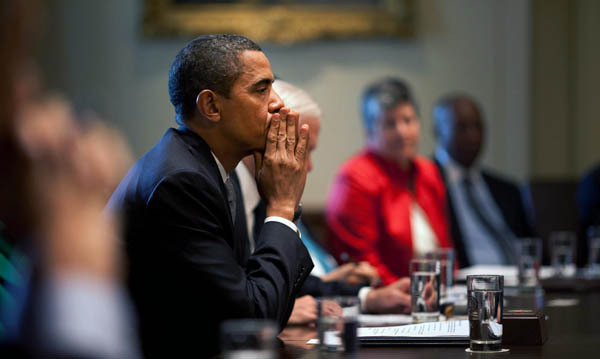 President Obama has both said and shown that the days when America dragged its feet on this issue are over. The environmental policies of Obama’s first months in office entailed the dirty job of digging out of the messy pile of Bush’s policies, while building a whole new mountain of better investments, tougher standards and guidelines for a cleaner, more sustainable future. Ahtisaari is a mediator who has dedicated his career to solving international conflicts. When he won his Nobel last year, he expressed frustration that so many conflicts had become frozen. Clearly, Iraq and Afghanistan topped the list. In the wider world, dialogue and negotiations are greatly preferred as instruments for resolving even the most difficult international conflicts. We forget that millions of people around the globe took to the streets (and still do) in protest against both Afghanistan and Iraq. It seems impossible to get an accurate count—in lives, pain, displacement, not to mention dollars—of the cost of these wars. Bitter Fruit – Behind the Scenes, America Buries Its Iraq War Dead asserts that the Iraq war, because of the scarcity of images available, has been largely invisible. The timing of this Nobel has put the U.S. in the scorching heat of the world’s spotlight in regards to Afghanistan in particular. Responsibly ending the war in Iraq remains a top priority. The president revealed his always growing understanding and constantly widening perspective when he said in March, “Going forward, we will not blindly stay the course.” The approach Obama is taking is all-encompassing and is another one of the reasons he won the Nobel Peace Prize. These Laureates seem to recognize Barack Obama as a transformative figure for peace. Our president knows that never before has anyone been made a Laureate so early into their term of office. He knows the magnitude of his challenges is yet to be met by the measure of his actions. But he knows something else, something that makes me also enjoy the rich pleasures of faith in him – he knows that peace matters. What do you think of the Nobel’s decision to award Barack Obama? Share your thoughts in the comments.